Gene Kloss, Song of Creation, Etching, 12" x 14"
A retrospective exhibition of more than 185 works from Gene Kloss’ 60-year career, A Kloss Celebration: Prints, Paintings, and Poetry, is one view through November 28 at the Sangre de Cristo Arts Center in Pueblo, CO. The artwork of Gene Kloss -93 is a hidden treasure. Perhaps because she was a woman, perhaps because she was a printmaker, perhaps because she was younger than the artists in the Taos Society – whatever the reason, Kloss is seldom mentioned in discussions about the early Taos art colony. 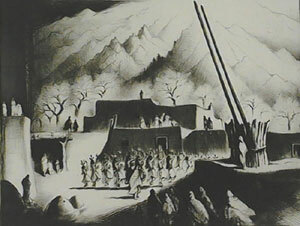 Yet she began producing intaglio prints in and around Taos in the mid-1920’s and continued through the mid-‘80’s, creating a significant body of work. Gene Kloss, Chance Encounter, Etching, 11" x 14"
Born Alice Glasier in Oakland, CA, Kloss grew up amid the worldly bustle of the San Francisco Bay Area. She attended the University of California at Berkeley, graduating with honors in art in 1924. She discovered her talents in intaglio printmaking during a senior-year course in figurative drawing. The professor, Perham Nahl, held up a print from Kloss’ first plate, still damp from the printing process, and announced that she was destined to become a printmaker. In 1925, Gene married Phillips Kloss, a poet and composer who became her creative partner for life. The match was uncanny, for in her own way Gene, too, was a poet and a composer. Like poetry, her artworks capture a moment in time; like music, her compositions sing with aesthetic harmony. 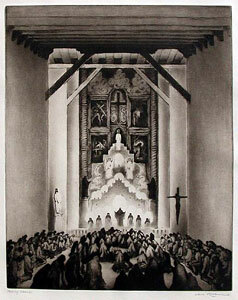 Although she was largely self-taught, Kloss was a printmaking virtuoso. On their honeymoon the Klosses traveled east from California, camping along the way. They spent two week is Taos Canyon – with a portable printing press cemented to a rock near their campsite – where Gene learned to appreciate the wealth of artistic subject matter in New Mexico. The landscape, the cultures, and the immense sky left an indelible impression on the couple, who returned every summer until they made Taos their permanent home 20 years later. 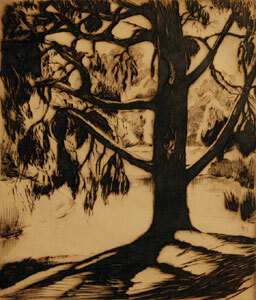 Gene Kloss, Carmel Evening, Etching, 5.5" x 4.5"
Throughout her life, Kloss etched more than 625 copper plates, producing editions ranging from five to 250 prints. She pulled every print in every edition herself, manually cranking the wheel of her geared Sturges press until she finally purchased a motorized one when she was in her 70s. 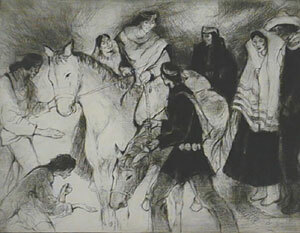 Believing that subject matter dictated technique, she employed etching, drypoint, aquatint, mezzotint, roulette, softground, and a variety of experimental approaches, often combining several techniques on the same plate. She also produced both oil and watercolor paintings. Kloss’ artworks are filled with drama. Her prints employ striking contrasts of darkness and light, and her subjects are often illuminated by mysterious light sources. Though she was a devout realist, there is also a devout abstraction on Kloss’ work that adds an almost mythical quality. For six decades Kloss documented the cultures of the region-from images of daily life to those of rarely seen ceremonies. She and her husband shared a profound respect for the land and people, which made them welcome among the Native American and Hispanic communities. Kloss never owned a camera but relied instead on observation and recollection. Her works provide an inside look at the cultures she depicted yet at the same time communicate the awe and freshness of an outsider’s perspective. Gene Kloss, Morning Sunlight, Etching, 6" x 5"
Although Kloss is best known for her images of Native American and Penitente scenes, she found artistic inspiration wherever she was. During the early years of their marriage, when she and Phil returned to the Bay Area each winter to care for their aging families, she created images of the California coast. And when the Klosses moved to southwestern Colorado in 1965, she etched the mining towns and mountainous landscapes around her. In 1970 the Klosses returned to Taos and built a house north of town. Though her artwork continued to grow in popularity, she remained faithful to Taos’ Gallery A, where she insisted that owner Mary Sanchez keep the prices of her work reasonable regardless of its market value. Kloss continued to etch until 1985, when declining health made printmaking too difficult. From her first exhibition at San Francisco’s exclusive Gump’s in 1937 to her 1972 election to full membership in the National Academy of Design, Kloss experienced a selective fame. She received numerous awards, and though she is not as well known as members of the Taos Society of Artists, her works are in collections throughout the world including those of the Metropolitan Museum of Art, the National Gallery, the Library of Congress, and the Museum of Tokyo. Kloss was 93 years old when she died. Alive for most of the 20th century, she witnessed vast changes in our society and landscape. Yet to look at her artwork, one would never know that the world changed. There is remarkable continuity in style and subject matter through the years that gives her work a timeless quality. This is enhanced by Kloss’ ability to capture the spirit of people and places. 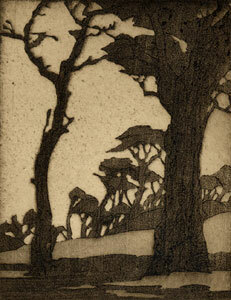 Her etchings turn brief moments into lasting impressions. Jennifer Cook is curator of visual arts at the Sangre de Cristo Arts Center.